Holly Craig's family have lived happily in Huntersbrook for generations but when times grow hard, even she must admit defeat and sell off their once-successful stables. The three Craig children, Lainey, Joey and Pippa find themselves locked in a fight to keep their beloved Huntersbrook; dare they transform it into one of Ireland's most sought after countryside venues? Renovation work is well underway when life rears its ugly head and everything stops in its tracks. The Craig family is forced to reassess what matters and although they no longer live at Huntersbrook, can the house work its magic even so ... and lead them into the light once more? 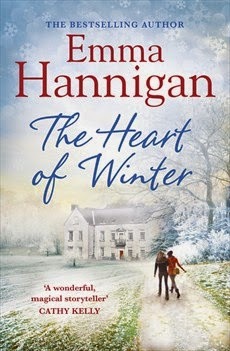 I first discovered author Emma Hannigan last year when I was doing my yearly Christmas feature and I was sent a copy of Driving Home for Christmas which I loved and I have been read more books by her this year Perfect Wives and The Summer Guest and now I have just finished The Heart of Winter and I am quite sad it is over. This book revisited our characters from Driving Home for Christmas and follows on with the families plan to open Huntersbrook House up to the public for venue hire. As the family pull together to get everything in place to make this venture work so they don't lose their family home, we begin to see what changes have occurred to Joey, Pippa and Lainey's private lives too. I loved catching up with these characters and I was surprised how much they wound me up and made me want to throttle each one of them and yet I loved them at the same time! I think if people hadn't read the first book then their opinion of Joey may differ with just reading this book as he seems to have let his career go to his head in this book where as I thought he was a loving character in the previous book so having this background gave his character the benefit of the doubt. Typical Pippa is yet again unpredictable and a walking danger! But I like how her character progresses in this book. Lainey I really struggled with some points I wanted to hug her and I my heart went out to her then on other times she really got on my wick. Each chapter was alternated between each of the three siblings which worked really well for this book. To add to this book we are also treated to an insight to the lovely Jodi from Perfect Wives who I loved and I was so pleased to see her arrival in this book and see what is going on in her life now. This was a feel good read great for the cold winter nights ahead to sit and dissolve into this storyline. It reminds us that family should always be there for each other to pull each other through trying situations. There were some sensitive issues that were effecting our main characters and once again Emma manages to write about these in a delicate but informative way. I do think this book could be read as a stand alone but I do recommend reading Driving Home for Christmas so you can get to know the background of these characters. This is a book that has a lovely winter cover and a storyline with a touch of festivity but this book could be read any time of year. This is yet another winner for me from Emma Hannigan she has become a firm favourite of mine.